I read this article and found it very interesting, thought it might be something for you. The article is called 25 Indian States Ban Plastic Bags. Yet, 600 Truckloads Of Plastic Discarded Every Day https://www.indiaspend.com/25-indian-states-ban-plastic-bags-yet-600-truckloads-of-plastic-discarded-every-day-31602/. Plastic waste at the Achen dumping site in Srinagar. Jammu & Kashmir announced a blanket ban on use of polythene bags in January 2018, but the implementation is lax, as is the case with 24 other states where some form of ban exists. Srinagar: Twenty five Indian states/UTs now have some form of ban on polythene carry bags, but implementation is often lax, and plastic--which takes hundreds of years to decompose--continues to be used, which gathers in India’s water bodies and landfills, according to an IndiaSpend investigation. In Jammu and Kashmir, many vendors have not heard of the three-month-old ban. In Karnataka and Punjab, where a ban is in place since 2016, it remains ineffective in most parts, as there is widespread availability of and demand for polythene bags. In Arunachal Pradesh and Uttar Pradesh, there is confusion about permissible grades of polythene. In Uttarakhand, the use is “gradually fading out”, experts said, while in Rajasthan, awareness campaigns seem to be paying off. Jammu & Kashmir and Maharashtra became the latest states to ban the use of polythene carry bags--in January and March 2018, respectively. Using a plastic bag can attract fines--from Rs 500 to Rs 25,000-- and storage and distribution can lead to imprisonment up to five years. Every day, Indian cities generate 15,000 tonnes of plastic waste--enough to fill 1,500 trucks, at 10 tonnes per truck--of which 9,000 tonnes are collected and processed/recycled, while the remaining 6,000 tonnes, or 600 truckloads, usually litter drains, streets or are dumped in landfills, according to a January 2015 assessment report of the Central Pollution Control Board (CPCB). About 66% of plastic waste is mixed waste--polybags and pouches used to pack food, mainly from residential localities, the CPCB report said. Plastic additives from landfills can cause considerable pollution problems by contaminating the surrounding soil, ground or surface waters, a 2015 study by the CPCB showed. About 1 million seabirds and 100,000 marine mammals die each year globally from ingesting plastic or by getting tangled in nylon fishing line, nets, six-pack plastic can holders, and plastic rope, according to estimates. In May 2012, two Supreme Court judges, Justice Singhvi and Justice Mukhopadhaya, said that “the next generation will be threatened with something more serious than the atom bomb” unless a “total ban on plastic is put in place”. India generates 5.6 million tonnes of plastic waste annually, and the country accounts for 60% of plastic waste dumped into the world’s oceans every year, estimates suggest. Three of the world’s ten rivers which carry 90% of plastic to the world’s oceans are in India--the Indus, the Ganga and the Brahmaputra, according to an October 2017 article in Environmental Science & Technology, a global journal. The alternatives to plastic, such as cotton or jute bags, are often expensive. So, some states permit polythene bags above 50 microns thickness, as it is likely to “increase the cost by about 20% [and] hence, the tendency to provide free carry bags will come down and collection by the waste-pickers [will] also increase to some extent”, according to the Plastic Waste Management Rules 2016. Twenty Indian states have a complete ban on manufacture, supply and storage of polythene bags and other plastic items such as cups, plates, spoons, glasses while five states have a partial ban. Source: Data provided by Central Pollution Control Board; *For Maharashtra, information is from news reports. Following Jammu & Kashmir’s ban on use of polythene bags, we spoke to local shopkeepers to assess the level of implementation. Most shopkeepers and vegetable sellers whom we spoke to said the government needed to start with regulating polythene manufacturing and penalise those carrying plastic bags. A waste workers sorts through plastic waste in Srinagar. Most shopkeepers and vegetable sellers whom we spoke to said the government needs to start the polythene ban with regulating manufacturing, and penalise those who are seen carrying plastic bags. 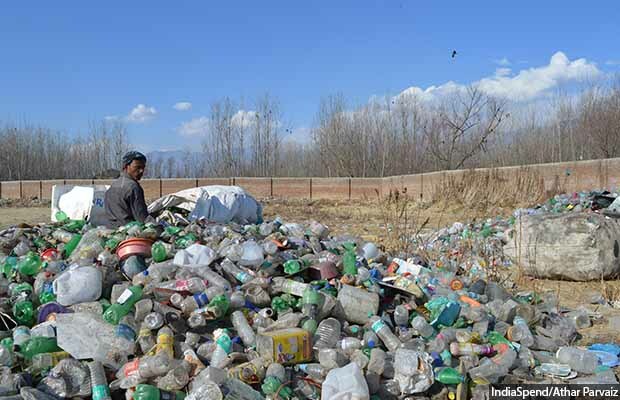 The suggestion of penalising those who are found carrying polythene bags sounds “interesting”, said Riyaz Ahmad Wani, the municipal commissioner at Srinagar Municipal Corporation, as it has the potential of delivering good results. In Karnataka, there is a blanket ban on manufacture, storage, distribution and use of plastics such as carry bags, banners, plastic plates, cups and spoons. Yet, the ban is “ineffective in several areas though it is certainly making some impact in some parts”, Megha Shenoy, adjunct fellow at the Bengaluru-based Ashoka Trust for Research in Ecology and the Environment (ATREE), told IndiaSpend. “There is no system to audit or validate this enforcement. This validation should be done by a third party that is not an enforcer [itself],” Shenoy said. Several political parties--including the ruling party in the state--widely use flex banners, buntings and other banned plastics, Shenoy told us, as administrative officers are unable to enforce the ban on these parties. In Punjab, where there is a similar blanket ban, polythene bags continue to be used, Harminder Pal Singh, a professor of environmental science at Punjab University, told IndiaSpend.“Even polythene bags of low grade quality [which cause more damage] are in use across Punjab and they are also used for carrying food items--both raw and cooked,” Singh said. Officials sometimes fine shopkeepers, but such measures have to be consistent, Singh said, adding that the ban is not even working in Chandigarh, a union territory, where it could have been implemented far more easily than in Punjab. “We had managed to close down all the plastic carry bags manufacturing units in Punjab,” Krunesh Garg, chief environmental engineer at Punjab Pollution Control Board, told IndiaSpend. “But, polythene is being pumped into Punjab from other states--mostly from Gujarat--and its distribution and use is not being stopped by the local authorities which renders the ban ineffective,” Garg added. In some states, there is confusion about whether the ban is complete or partial. Tapek Riba, member secretary at the Pollution Control Board of Arunachal Pradesh said polythene carry bags are not completely banned in his state, whereas information collected by IndiaSpend from CPCB showed that there is a complete ban. “The restriction is only on [polythene bags of] thickness of less than 50 microns,” Riba told IndiaSpend. “In some districts, it is completely banned, but in most of the districts, it is partially banned,” Riba said, adding that on random checks, the authorities ascertain thickness by feel/touch. In Uttar Pradesh, lobbying led to dilution of the blanket ban to a partial ban on bags with thickness below 50 microns. resulted in alteration of the ban. “We conduct raids and impose fines, but it doesn’t seem to be working,” Pankaj Bhushan, environmental engineer at Lucknow Municipal Corporation, told IndiaSpend. “The use of plastic carry bags is gradually fading out in Nanital,” Pankaj Tiwari, executive director of the Nanital-based Central Environmental Himalayan Association in Uttarakhand, told IndiaSpend. The ban is being implemented to a large extent, Tiwari said, even as a lot needs to be done to implement the ban fully. A total ban looks impossible unless “a top-down approach is adopted and production of plastic is controlled or regulated”, S P Subudhi, member secretary of the Uttarakhand Environment Protection and Pollution Control Board, told us. Rajasthan has managed to create awareness about the harmful effects of polythene, Manoj Bhardwaj, deputy mayor of Jaipur Municipal Corporation, told IndiaSpend. We need to create role models from the top. If business groups and government offices get plastic free, it will be easy to communicate the message to masses.--S P Subudhi, member secretary, Uttarakhand Environment Protection and Pollution Control Board.